A Beginner's Guide to Winches: 7 Essential Types of Winches on the Market | Compresstech Resources, Inc. In the previous post in this two-part series, we tackled 7 common applications of winches that you should know. This second post now focuses on the available types of winches. Winches are defined as devices that wind up and wind out rope. This operating concept might sound simple, but it has turned the winch into a multipurpose tool that can be found on trucks, on ships, and even in wakeboarding parks. Continual redesigns and innovations have resulted in the various kinds of winches that can be found on the market today. Understandably, the differences between these types can confuse first-time buyers or operators. 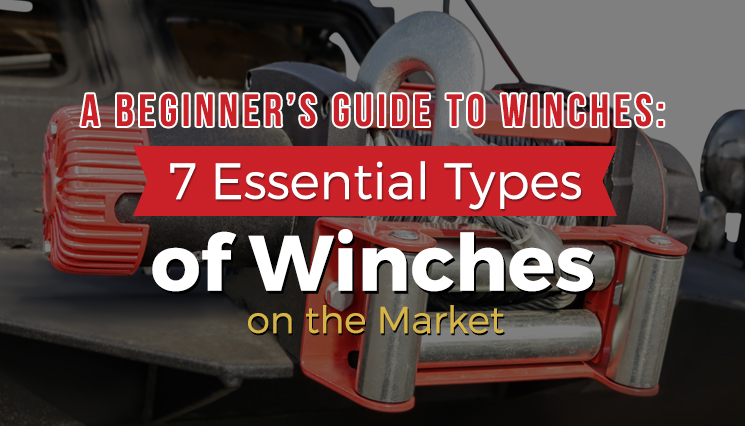 To help you decide on the winch that best fits your needs, here’s a rundown of 7 essential types of winches and their key characteristics. Most winches use spools, but the lever winch moves its rope with self-gripping jaws instead. By cranking the lever winch with its handle, you can easily move objects that weigh at least half a ton. This make the lever winch useful on construction sites or for jobs that frequently deal with heavy loads. Snubbing winches have vertical spools and a conventional ratchet system but lack crank handles, unlike other types of winches. They reel in their rope with the help of tail lines. Once a snubbing winch is wound up or stopped, it can take loads even with low operator tension. An operator can also maintain control over tension and pressure relief using the friction of the line around the spool. This type of winch is suitable for adjusting the lines on small vessels such as sailing boats and dinghies. You might also see one of these devices supplementing a primary winch for heavier tasks as well. Also referred to as power winches or air tuggers, air winches are often strong enough to lift or suspend materials. For this type of winch to work, air passes through the winch motor’s drive mechanism, with condensation forming as a byproduct. Water may drip from underneath the winch as a result, although this can be addressed with large water filters and traps in the winch’s airline. Oil foggers also help prevent the inside of the motor from rusting up or corroding. FACT: Air winches tend to cost more and produce loud whistle-like noises during operation, but they compensate greatly by being more durable and powerful than their hydraulic, diesel, or electric counterparts in general. The defining feature of this type of winch is its vertical axis. Aside from that, it works similarly to windlasses with horizontal axles. This rotating device can pull, suspend, or apply pressure to loads on vessels. Capstan winches are designed to be mounted on ships, where sailors use them to reposition sails, cables, and other lines. DID YOU KNOW? On older sailing ships, several deck hands worked together to manually turn large capstans. To synchronize their actions, sailors would sing sea shanties and match their movements to the beat. For a glider to leave the ground, it has to be pulled to speed by a glider winch. These types of winches are operated from the backs of heavy vehicles. Most glider winches run on LPG, diesel, or petrol, although electric or hydraulic devices may also be available. Cables for this type of winch measure between 1,000 to 2,500 meters in length. A glider winch pulls an aircraft up to speed until the aircraft lifts off the ground and enters a steep climb. Once the glider reaches a height equivalent to 35% of the cable length, the lever is released to complete the launch. This type of winch is used to secure the shipboard end of a vessel’s mooring line, keeping the vessel in place in its berth. It can also help adjust the length of the mooring line, especially when accounting for changes in draft and tide. Mooring winches usually have more than one barrel to pull in cables and ropes, with the number of barrels depending on the size of the ship. Watersports enthusiasts may be familiar with this type of winch. Wakeskate winches generally have simple designs, including a spool, an engine, handles, and rope. A person first swims away from the winch or moves into position on a starting dock. Then, the winch pulls the rider so that their wakeboard glides across the water at 24-40 kilometers per hour. Wakeskate winches can be attached to trees, set in the ground with skates, or mounted on the back of a boat. Winches can also be classified according to other specifications, such as by their drive type (pneumatic, hydraulic, diesel, or electric). However, knowledge of these 7 essential types proves useful when determining the best winch for a given application. It also helps to keep in mind that there are several differences between winches and hoists, so one cannot substitute for the other. Before finalizing any buying plans, you might want to seek advice from experts who can help you find the right type of winch. Compresstech has been a leading supplier of world-class equipment, ranging from air compressors to hoists and winches. We also offer complete solutions to help our clients get the best results from their newly acquired machines. Feel free to contact us today for inquiries or questions! Did you find this post helpful? Visit our blog for more articles about winches and industrial equipment.